Grazie per aver partecipato al “People Make Places Venice” Match Box Project! Saremo liete di viaggiare con la tua bella scatola e condividerla in giro per il mondo. Lunedi sera porteremo con noi pi� di 300 scatole di fiammiferi della magica Venezia (compresa la tua) alla OSTERIA DELLA RIVETTA Santa Croce 637a (30135) Venezia (19:00-21). Invitiamo te e i tuoi amici a venire a vederle e a salutarci. Join us to celebrate and farewell the 300+ impressions of Venice we will be taking with us (we leave on Tuesday). 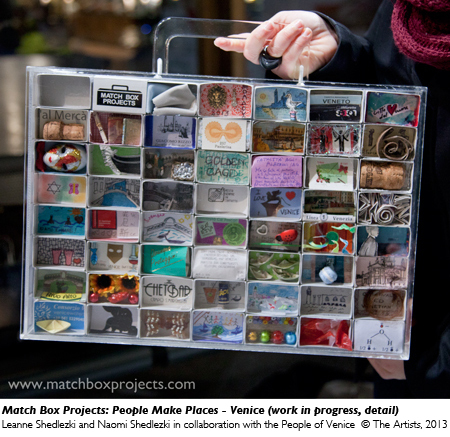 Thank you for participating in our “Encounter” and/or “People Make Places Venice” Match Box Projects! We are looking forward to travelling with and sharing everyones beautiful Venice matchboxes around the globe. On Monday evening we will take with us 300+ magical Venice matchboxes to OSTERIA DELLA RIVETTA Santa Croce 637a (30135) Venezia (19:00-21). We invite you and your friends to come and say goodbye before we return to Australia. This entry was posted on Monday, March 17th, 2014 at 2:28 pm	and is filed under Our Blog. You can follow any responses to this entry through the RSS 2.0 feed. You can leave a response, or trackback from your own site.